Over the last decade Shariah-compliant funds have emerged as one of the most eloquent expressions of Islamic Finance, exemplifying its evolution into a dynamic and diverse industry. Understanding the issues faced in developing, managing and investing into these financial products constitutes an integral component of Islamic wealth management. In order to identify key trends within this landscape, one must first scrutinise the industry’s make-up, from fund origination to product evolution. This provides the groundwork to further analyse how assets are being allocated as well as overall fund performance (from risk-return relationships, sector correlations, to fund behaviour across various market cycles). It is then possible to highlight the latest market developments as well as pinpoint which product gaps still remain. These are just some of the tools needed to tackle the ultimate challenge for Islamic wealth management – building a diversified, efficient and fully-compliant portfolio. 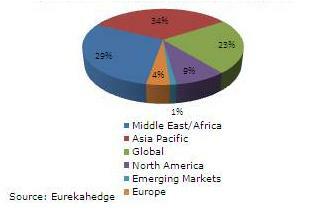 Current Eurekahedge research now maintains information on more than 608 Islamic funds from across the globe and across all asset classes, with the total universe of products estimated at close to 650. Equity exposures dominate this figure as they represent over 52% of the total (342 funds to be precise). A distant second goes to private equity and real estate offerings with a combined 18% of the total. Whereas money market, balanced and fixed income have much smaller showings (13%, 8% and 6% respectively). Other products – predominantly leasing funds – round off the total at 4%. A decade ago, one would have relied mostly on the established markets of Saudi Arabia and Malaysia to find approximately 100 funds available. Investor awareness at that time would have been much lower than what it is today. Only now is a clear picture – of what Islamic products are available – beginning to emerge with market research, having evolved substantially in the past few years. Simultaneously, the isolated development of the two core markets of Asia and the Middle East is no longer the case either. Their lead – as well as their economic integration – has been supported by a wave of new market participants that have rallied the industry past the 600 mark. Arguably a critical mass has been reached, triggering interest from institutional investors as well as non-Islamic institutions. More assets being committed to Shariah-compliant investments and longer track records are at last available for closer scrutiny (the average trading history now exceeding 36 months). This is not a trivial figure, as historical data between three to five years can yield relevant fund metrics and in turn help these products fall under the scrutiny of a wider range of allocators. Estimates to the total size of the industry seem to have reached a US$800 billion consensus, although this is an all-encompassing figure (from bank deposits to direct investments) that does not address investment vehicles directly. As far as assets invested in Islamic funds, US$44 billion serves as the starting point, and taking into account non-reporting funds, the overall assets under management are closer to a US$59 billion estimate. In the greater scheme of things, this remains a modest amount but provides solid evidence of long-term sustainable growth rather than a short-lived fad. An inflection point in terms of the number of Islamic investment vehicles can be observed between 2002 and 2003 (as shown in Figure 1). There are multiple reasons for this, both tangible (an increase in petrodollar liquidity, an investment shift favouring reinvestment in the GCC region, as well as maturing capital markets) and intangible (customer’s greater understanding and acceptance of these products, as well as a generational change in terms of market participants). The number of fund launches has been consistent with a peak in 2007 of 158 products introduced, and this provides a good measure of the industry’s overall development. This represents a 50% improvement from 2006 (which tallied 105 launches), with the overall Islamic funds industry having more than doubled in size in the last three years (with 345 new products between 2005 and 2007). These figures exclude the 55 obsolete funds which have come and gone over the past two decades (some exiting as early failures but the majority retiring within their projected tenors), representing a healthy attrition rate of less than five funds per year. Therefore it would not be surprising to see 700 products by the end of 2008. There have already been over 25 new launches in the first quarter of the year and this is in line with a projected 100 new funds by year-end (matching the 2006 tally). Structured products: There are now over 40 structured products in the market (from investment certificates to capital protected notes) and while assets remain small, a particular manager has raised over US$300 million within two years through their capital protected range. This is a burgeoning area as these instruments are providing access to certain exposures that have previously been impossible to achieve through a traditional mutual fund structure. Exchange-traded funds (ETFs): ETFs are similarly small in terms of assets (over US$140 million invested) but these products have made significant inroads and there are now over a dozen currently available. Indexation is an area that will see further growth as there has been a wide array of sector and country-specific indices developed recently (from all major index providers). The high correlation of fund performance to major indices has also increased the rationale for using them. Fund of funds: Most of the 34 multi-manager products originate from Saudi Arabia, and in all they channel US$900 million into Islamic investments. Arguably pioneers of Islamic portfolio construction, fund of funds have had to contend firsthand with the issue of product gaps and track-record scarcity. In fact some label themselves as a portfolio rather than a classic fund of fund, as they address these constraints by incorporating a proprietary trading component (straight into equity and new sukuk issues) or flexibility to take on direct investments (sometimes into illiquid investments such as real estate). 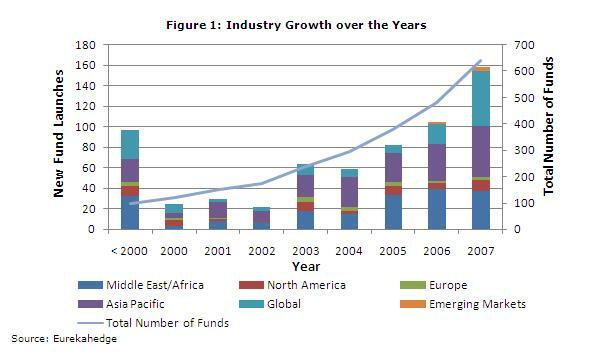 The established markets have continued to flourish (namely the Middle East and Asia Pacific) and at the same time less traditional exposures have been introduced into the marketplace, as shown in Figure 3. Oddly enough North America and Europe represent 15% of the total, although investments in these regions is often combined into Global mandates – which in turn make up almost a quarter of the total. Nonetheless, the two core regions remain as key drivers of the industry. However one cannot undervalue the new offerings and in fact, a third region can be argued for in terms of all the products spread across the periphery (Egypt, Indonesia, Pakistan, etc). 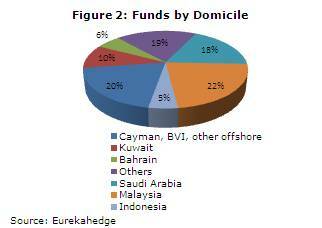 Offshore domiciles (as evident in Figure 2) are another sign that Islamic funds are increasingly being marketed across multiple domiciles and with more sophisticated structures. There is further evidence that market participants are fast evolving – on one hand the more established players are expanding regionally, and on the other new entrants are leveraging their country and/or sector expertise. In addition, overall investor appetite is for diversification and incorporating new exposures into their portfolios; thus feeding the demand for emerging markets (ie India, China, etc) and developed markets as well (ie Canada, Japan, etc). This has not only broadened the product spectrum but also introduced a greater challenge in terms of investor’s due diligence requirements. Although finding these funds is much easier than before, there can be difficulties in analysing managers (both quantitatively and qualitatively) with such a wide geographical dispersion. The proliferation of fund managers and the rise in assets under management are tangible evidence of a burgeoning industry. This must also be considered alongside a less tangible metric of product quality – an additional benefit from greater competition and the arrival of fresh new talent. Consequently, the level of sophistication is on the rise, with experienced long-only managers and a greater pipeline of structured products entering the fray. 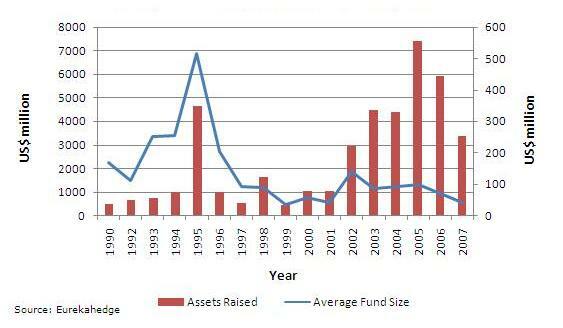 The number of funds segregated by fund size provides a more telling statistic (as shown in Figure 4), as this is not a bell-shaped curve as might be expected, but one skewed towards smaller-sized funds with a significant tail extending to larger-sized funds. 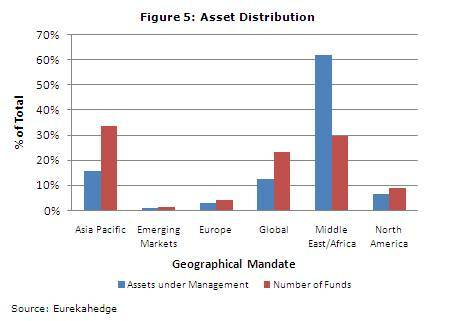 This relies on a smaller sample of reporting funds (486 of them) however there is an unmistakable imbalance in asset allocation – partly due to the local focus of most fund managers (as they have catered to their domestic constituents) and also to the specific size of their home markets (in fact many new mandates emphasise their cross-border exposures as they seek to avoid such constraints). Thus the average fund size in Saudi Arabia stands at US$170 million and in Kuwait this figure is approximately US$100 million. In contrast, the average fund size is US$44 million and US$10 million in Malaysia and Indonesia respectively. Recent launches have also emphasised the appetite for geographical diversification, with global mandates growing from 19% in 2006 to 34% in 2007. Emerging markets made their first-ever appearance in the last two years, and while their numbers remain modest (five in all) they are further evidence of growing investor appetite. Innovative structures have also been developed, with funds of funds, ETFs and listed real estate funds among the latest buzz words. The distribution of assets tells a different story though, as seen in Figure 5, with a strong predilection for certain markets putting into question how geographically diverse is a typical Islamic portfolio. Approximately 62% of assets are still retained in Middle East mandates (but only represent 29% of all products), partly due to an adherence to legacy investments, a continued appetite for GCC economies and more effective marketing channels. Asia Pacific comes a distant second at 16% of assets even though it is the source of a third of all products in the market. It could even be argued that Asia is outpaced by assets in developed markets (Global, European and North American mandates) as these add up to 22% of assets and 36% in terms of number of products. 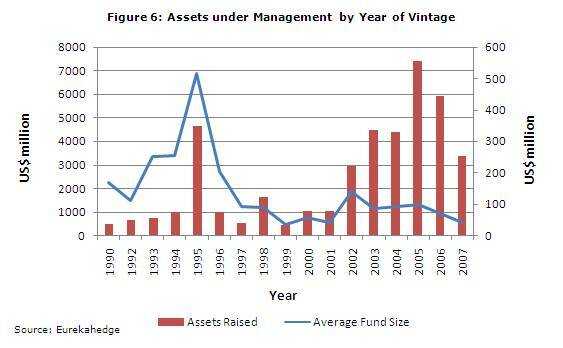 As might be expected, track records remain ever-important, but younger funds have not encountered major difficulties in raising assets, as illustrated in Figure 6. This does not mean that past performance is discounted, but rather that the appeal of these strategies compensates for their short lifespan. As a matter of fact, several fund managers have supported the marketing of their Islamic products by highlighting the track record of their conventional product range. Southeast Asian funds have benefited most from this approach, as exemplified by various pan-Asian and China-focused products that have older siblings in the conventional world. In terms of asset allocation, there is currently a trade-off between what an investor needs (track records, fund manager familiarity) and what an investor wants (performance, new exposures, etc). For instance, the 1995 vintage commands well over US$4.6 billion in assets although this is concentrated in less than a dozen funds that can be characterised as traditional. Conversely, the 2005 vintage so far holds the record with US$7.3 billion raised for that year, illustrating the allure of products that have come to market. In fact, the last five years are testament of a consistently liquid marketplace with approximately US$26 billion being invested during this period. Average fund sizes have also gradually decreased over the last five years (down to US$42 million for 2007) making it clear that this is an ever-more crowded marketplace. Islamic funds, because of their long-only nature, do not necessarily have an issue in terms of capacity constraints (ie there is no maximum size limitation). On the other hand, there is no prescribed minimum size for them to survive either. An optimal fund size however, will be predominantly influenced by the market (or markets) where the fund is invested, although this does not seem to be a major concern at this stage. As the number of available products continues to grow, the mix of Shariah-compliant offerings (in terms of asset classes) can be tested against the one offered at the conventional level. Table 1 portrays the mix of Islamic funds by investment geography and compared to a global portfolio of conventional funds (with statistics from the Investment Company Institute (ICI)). This heat map facilitates an assessment of whether any sector deviates from the conventional mix. The prominence of equity funds is felt across all regions (from 41% to 55%), but this is no different to the proportion found with conventional funds (42%). 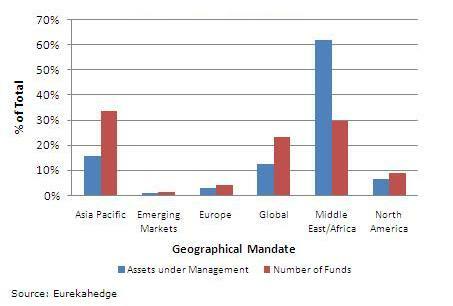 Money market funds are also well received – particularly in Global and Middle East mandates (at 21% and 13% respectively, well above the conventional 6%). They remain popular everywhere except in a European and North American offerings, where capital markets are not yet viable for these types of instruments. With regards to product deficiencies, fixed income and balanced products are found to be lacking in all but one of the geographies. Asia Pacific seems to offer the closest match to conventional markets, yet it is the greater acceptance of Malaysian sukuks that might limit the appetite for the fixed income and balanced offerings found in this region. This could have further implications for Takaful investors, as insurance companies have a predilection for balanced products. The popularity of European and North American real estate products, as well as Middle East multi-manager portfolios, is manifested in the “Others” category (at 50% and 57% respectively). 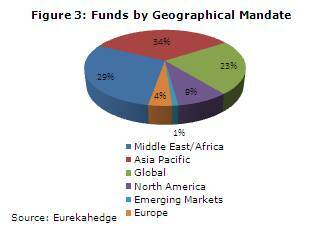 Private equity funds are also categorised here which accounts for their strong showing under these geographies. Fee structures: Average management fees of Islamic funds have gradually increased particularly with regards to equity funds, and this has been more pronounced with mandates in Middle East (the average fee now at 1.7%) and Asia Pacific (the average fee now 1.59%). This has been prompted by a more active management approach (more analysts needed and greater trading turnover) and investments across a multiple geographies (augmenting the need for internal and external equity research). This however is in line with that of Global, European and North American mandates (averaging 2.75%, 1.76% and 1.28% respectively). In contrast, there is a slight downward trend across money market funds (across all geographies), while fixed income and balanced products have kept relatively stable fee structures (across all geographies). 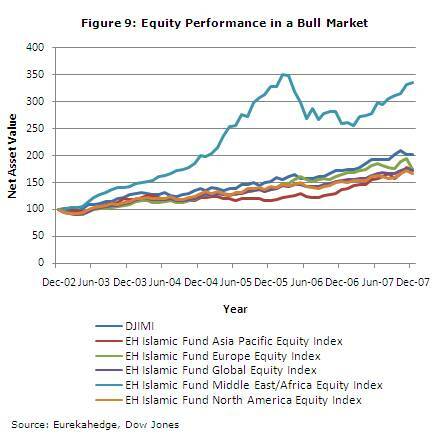 Benchmarks: The proliferation of Islamic equity indices was initiated by the Dow Jones Islamic Market and it remains the most quoted index family, although S&P, MSCI and FTSE have made significant inroads in recent years. Equally popular are indices which are country/region specific (being offered by boutiques such as Global Investment House and Al-Madar), as well as composite/in-house benchmarks. This activity has now provided numerous tools for fund managers, both in terms of benchmarking as well as to base index-linked products. Shariah advisors: Traditionally, Islamic funds have been generated within established fund houses with a large fund range – making it practical and cost-effective to have an internal team of Shariah scholars. However, as more and more non-Islamic institutions enter the market, it is now commonplace to find Shariah compliance being attained through third-party boards. This has given greater momentum to the entry of specialised consultancy firms, although the average number of scholars within a board remains between three and four (regardless of whether it is internal or external). As mentioned previously, developed market funds (Europe, North America and Global) display a strong association with market indices, thus a performance analysis would have limited value. When it comes to the main markets of Asia and the Middle East, a direct comparison would also be unwarranted (as they respond to different market conditions); the data, however, supports the compatibility of these two regions instead. This is true across all the various asset classes available (as seen in Table 2). Long-only legacy: Both regions have had their ups and downs, and this is far more pronounced in pure equity funds as might be expected from a long-only exposure. 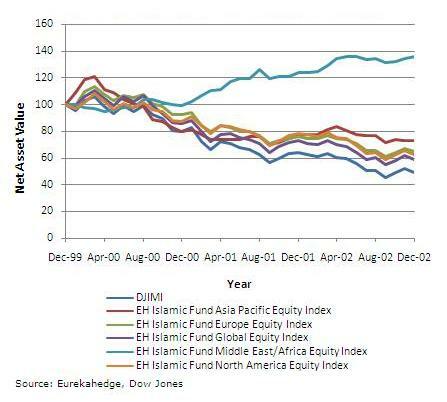 For instance Asian funds posted negative returns in 2005 (-1.66% overall, -3.66% for equity funds), whereas Middle East had a forgettable 2006 (-9.65% overall, -20.45% for equity funds). Timing the rebounds: These downturns notwithstanding, both regions have proven their resilience, with Asia recovering in the 2006-2007 period (with 13.2% and 20.72% returns respectively). 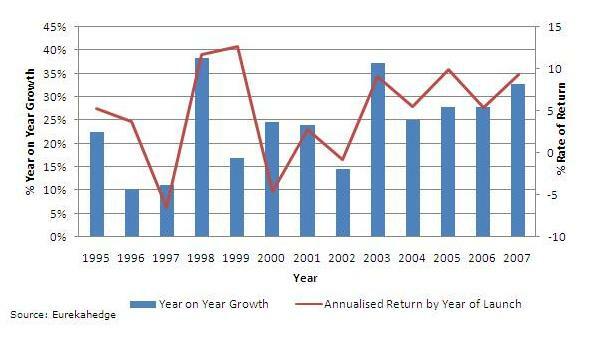 For Middle East funds, the returns observed in 2007 (26.95%) are reminiscent of the hey-days of 2005 (32.48%). Once again, this is far more pronounced in pure equity funds and shows that long-only investing comes down to a matter of timing, at least on the surface. Symbiotic detachment: While Asian economies have not decoupled from global markets, it is no secret that GCC economies are bucking the trend. From a diversification perspective, good years of performance in one region correspond to weaker years in the other (most evident in 2005 and 2006). A long-term investor would benefit the most from this apparent detachment by blending these exposures (rather than attempting to time the market cycles). Finding the right balance: Diversification is not only reasonable across regions but across assets classes as well. However, a blended approach is not that straightforward since the returns of balanced funds have yet to exhibit great levels of stability. To further scrutinise this, one can compare the returns of balanced funds against mixtures of equity plus fixed income funds (naive combinations of 50/50, 40/60, 60/40, etc). Asian balanced funds have actually underperformed these combinations by an average of 4%. The opposite is true for Middle East balanced funds, with the same combinations outperforming proper balanced funds by 2% to 6%. Similar to other screened investments (such as SRI), Islamic products eventually fall under the criticism that any such constrained investment cannot consistently outperform the overall market. Surprisingly though, the performance of Islamic funds has in fact been one of the key drivers of industry growth, where years with strong returns have been linked to years of product expansion. This is particularly evident in the 1997-1998 and 2001-2003 periods, as seen in Figure 7. The performance of Islamic funds – depending on the year of their launch – has as much to do with the overall industry growth as any other factor. Clearly the demand for these products increases after the performance metrics validate the initial investment decision. This rate has not been constant though, and while strong years are catalysts for growth, it is the combination of track records and new mandates that has established the right conditions for the industry. Due to restrictions imposed on certain financial instruments for not being Shariah compliant (namely derivatives and short-selling), the argument is often made that Islamic funds are long-only vehicles that will merely be closely correlated to overall stock markets. This has been debunked due to the expansion of fixed income markets (ie sukuk), increased trade in structured products (ie ijara/leasing contracts), and the introduction of additional exposures (ie listed real estate). It can be argued that Shariah screening provides for an early flight from securities prior to market downturns. 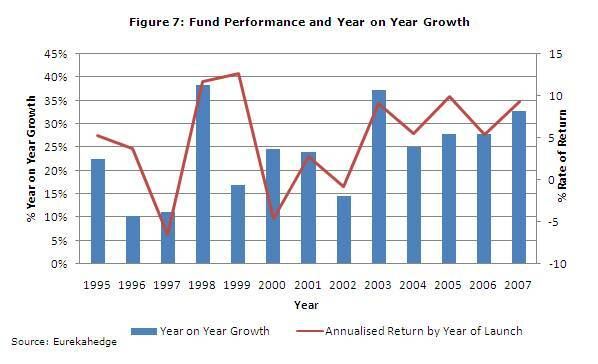 Due to the young characteristic of the industry, this analysis is limited to the period spanning January 2000 until the present and to the performance of equity funds, as seen in Figure 7. Two well-defined bear and bull markets have occurred in this period to allow a study in both of these environments. 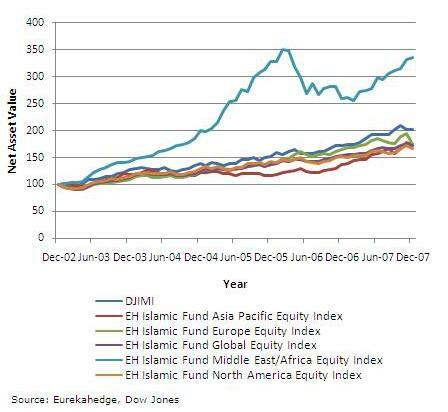 The Dow Jones Islamic Market (DJIM) world index is here used as a comparison tool against the performance of Islamic equity funds (using the corresponding Eurekahedge sub-indices). This effectively makes a passive versus active index evaluation, and provides a visual representation of the alpha being generated. This of course limits the analysis to equity funds only, setting aside fixed income, balanced and money market funds which are substantial in terms of track records, as well as asset sizes. A comprehensive analysis would incorporate all these instruments into a more complete correlation matrix. 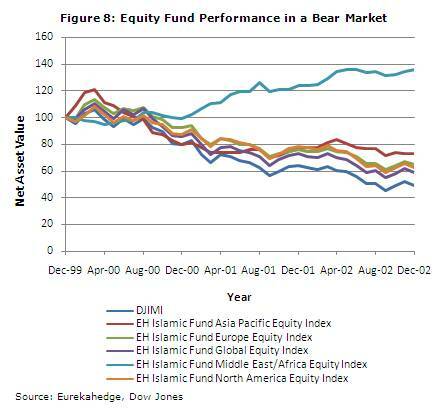 Bear market performance: As seen in Figure 8, the bear market spans roughly between January 2000 and January 2003, and the performance of Islamic funds during this period is evidence of varying levels of capital protection. The global Islamic fund index reveals a strong correlation to the market, but this is less evident when scrutinising the various sub-indices. There is also a gradual breakout from the DJIM index as the bearish conditions continue. The Middle East index exhibits very strong returns over this period – although the rise in net asset value is not immediate but with a lag of almost 12 months. European and North American mandates (which are also more closely correlated to the DJIM index) do not provide a substantial protection, although all the sub-indices eventually outperform the DJIM index during this time period (led by Asia-Pacific equity funds). Bull market performance: This market scenario, as seen in Figure 9, ranges from December 2002 to December 2007, and paints a less rosy picture. These funds arguably underperform the DJIM index during the uptrend (although this is more prominent in certain regions). The 2006 market correction in the Middle East dominates the behaviour of this specific index and to an extent distorts the analysis for such a limited time period. While Middle East returns are well above all other indices, they experience the greatest downturn as well. This highlights the increased importance of manager selection in both downward and upward trending markets, and the wisdom behind diversification as well as the cost-effectiveness of certain index-linked products. Preliminary observations such as these, while visual in nature, are substantiated by a correlation analysis of the sub-indices (Table 3). The strongest correlation exists between the European, North American and Global indices, with an almost perfect correlation between Global and North America. Notably, Asia Pacific exhibits the lowest correlations against all other indices, and the Middle East/Africa index has a similar tendency. On the whole, diversification benefits are derived mainly by adding a global component, although this also depends on the existing allocation of the portfolio. 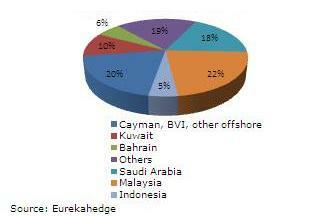 For example, a European portfolio would diversify best with an allocation into the MENA region. Most revealing though, a portfolio that is biased towards Asia-Pacific funds would be the one benefiting the most from allocating into Middle East mandates (and the same would hold true the other way around). A correlation analysis can also be performed in the bear and bull market periods in isolation (not shown here). In that case, Middle East funds have a negative correlation during the bear market, whereas the strong correlation of all mandates is greatly increased during the bull market. Closer scrutiny of country-specific equity benchmarks can also help polish the analysis (specifically with the availability of Islamic indices for Indonesia, Kuwait, Malaysia, Saudi Arabia, amongst others). Then again, the figures used here reflect the performance and correlations of equity funds, whereas fixed income and money market returns lack non-LIBOR indicators that would be necessary to incorporate them for a holistic analysis. Islamic finance continues to thrive – this is certainly not in dispute, but there are a variety of imbalances that are being addressed to the benefit of prudent asset allocators. Gaps which are evident in fixed income and balanced offerings are progressively being tackled, particularly by the proliferation and subsequent liquidity of sukuk offerings. Similarly, allocations continue to be biased towards Middle East exposures diminishing potential diversification benefits (and these in turn would be most prominent during market downturns). Nevertheless, the flood of new Shariah-compliant products is gradually reducing disparities and portfolio concentrations. This allows positive implications for portfolio construction, but only if coupled with adherence to proper due diligence principles. The fundamental changes taking place are conducting an overall shift in perspectives: from short-term to long-term allocations; from raw performance to risk-adjusted returns; from local players to global fund houses; from retail/high-net-worth investors towards institutional portfolios. Additional support is coming from innovative products currently in development, the entry of more specialised/sophisticated institutions, and the improved understanding and appreciation for Shariah. This is keeping the industry as one of the most dynamic components in the financial services sector today and for the foreseeable future.